​It's truly unfortunate ​that ​accidents happen and beautiful​ copper foil window panels get damaged. But it's a reality when dealing with glass that sometimes​ they do get broken. ​Repairing broken pieces takes time and patience, but even if you're still fairly new to making stained glass, you can still benefit from learning how it's done. Sooner or later you'll have a piece that needs repairing. ​Over the years, I've had a few projects that needed repairing before they were even completed! It was usually due to a heat crack that turned up during soldering.​ Maybe you've ​had pieces in need of repair from accidental breakage too? Well, if you do have some, ​​now you can see the process to repair them. ​Want to know what tools and supplies I used in the video? ​Here's a h​andy list. ​Every repair brings​ unique challenge​s and you'll learn a lot from doing them. I suggest starting with a simpler repair like the one shown in the video. The panel didn't bend or break in multiple spots which means that the integrity of the structure was still intact. This means that you can focus completely on the one piece without fear of the panel being unstable or easily fractured elsewhere simply by turning the piece about or tapping on the broken section. If you love this design, the stained glass dragon pattern can be found in the store using this link: Dragon Pattern. I'd love to hear from you! Leave reply in the comments and let me know what your favourite repair tips are. Thanks for this great video. Making a foil repair now seems more achievable. However, I do have one question. When you heated the solder and removed the foil from the opening, did it leave the foil intact on the surrounding edges? You didn’t mention having to refoil the surrounding glass pieces before you put in the newly cut replacement piece. I”m glad you found it helpful BJ. When I was melting the solder and carefully pulling the foil away using the pliers, that was the foil from the broken piece of glass. All of the foil on the neighboring pieces was left completely intact. 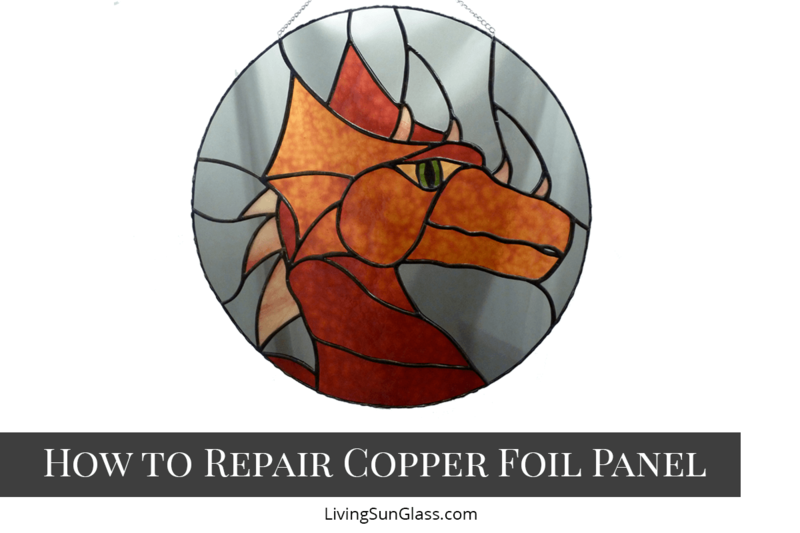 It’s important to work slowly and make sure the solder is molten before pulling the foil so as not to damage the copper foil on the surrounding pieces. If you do damage the foil on the surrounding pieces, you’ll need to remove them and re-foil them before assembling the window again. I have a problem. Copper patina on eagle just finished has spots that look tarnished. Have added more patina, cleaned and polished and still it is there!!! Hello Judie, I don’t know what would cause the spots like you mention, I’ve never seen that before. Perhaps something dripped on your project before you added the patins? You might try scrubbing the solder with steel wool, cleaning it and applying the patina again. If that doesn’t work, applying flux and re-soldering the areas with the spots should get rid of whatever the contamination was that caused the spots. Then you could clean it and apply patina as you normally would on a clean slate. Thanks for your feedback, Em. So glad you’ve discovered an easier way to do repairs now! Hello – I watched your patina video – so helpful! Thank you for sharing! I had a question, though – if you are foiling a large project and you have finished fluxing/soldering the whole thing (like an 18″ round piece or larger) – how do you generally wash off the flux and then later, the patina? Do you use a big tub or sink, or perhaps take it outside and use a hose? Hi Alison, with larger projects I sometimes take them downstairs to my laundry sink (it’a big, deep sink) or I just use a bucket with water and cleaner with a sponge and wash it on my work table. The work surface is painted plywood so it’s fine for me to get it sopping wet but it definitely takes more wipe downs with clean water to rinse it well when sponge cleaning it from a bucket. The sink can be easier for rinsing after scrubbing, but I have a balance disorder and don’t like going up and down stairs with anything in my hands let alone a large stained glass project! So I pretty much just use a bucket and sponge these days.